There are a lot of dogs that actually love the water and if you are lucky enough to share this interest with your furry best friend, then you have probably already considered trying to find a kayak for you and your dog. There are several different models of kayak available that are suitable for a dog, so you will not have to leave them at home the next time you want to take a nice trip out on the water. When you decide to try kayaking with your dog, it is important to take them into consideration. If your dog does not love the water, then you should probably start searching for a new kayaking buddy. Also, a dog that is a bit hyper and incapable of sitting still for more than a few minutes at a time would also probably make for more of a disaster than a fun time out. It is important to introduce your dog to the kayak rather than just throwing them in it and assuming they know what it is you will be doing. Give the dog the chance to explore the kayak themselves and check it out so they can become familiar with it. You can then sit down in the kayak yourself and invite your furry friend to come join you, so they can see what it is and what you are planning to do. Comfort will also play a key role in choosing a kayak for your dog as well. Finally, make sure to take it slow and steady and expect a learning curve when it comes to the kayak and your dog. Just like people, a dog should also be equipped with a life vest for safety while out on the water. Even if the dog is a swimmer, a life vest is a good idea to help prevent drowning if anything were to happen. You will also want to make sure you have their leash on hand and perhaps even have an extra one close by, just in case the first one happens to get misplaced. Adding a harness may also be useful and can even help if you need to pull them out of the water if they happen to fall in unexpectedly. Never tie your dog to the boat while you are out on the water, however, because they need to have the freedom to be able to swim in case they are in any kind of danger. 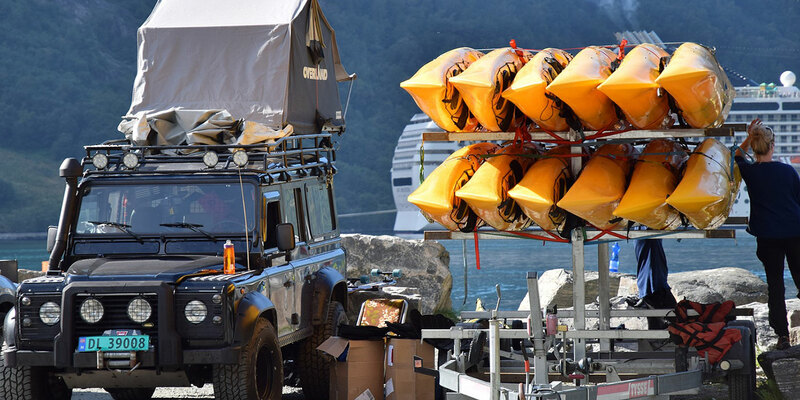 Finally, toys and rewards are always a good plan, especially when you are done kayaking and you are back on dry land. You will want to reward your furry friend for good behavior while out on the water. The learned behavior while on the water is important and will help maintain good behavior when exchanged for rewards and playtime in the water. A tandem kayak is ideal for a larger dog, however, many paddlers have trained their furry friends to perch on the bow of a sit-on-top inflatable or to crouch near the navigator’s legs in a sit-in hard shell. Tandem kayaks allow for more room which can lead to a more comfortable position for yourself and your dog. However, they can also come at a much higher price point. 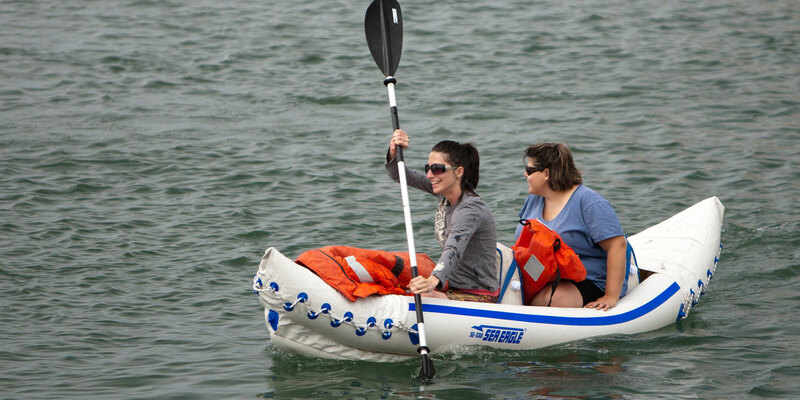 A sit-on-top kayak is a more affordable option and is often pretty easy to use. They are built for multipurpose activities and offer more comfort than some of the standard kayaks you just sit inside. They offer a bit more flexibility and are not as confining either which could make them a more comfortable option for your dog. No matter which kayak you select to paddle with your friend, make sure your dog is fitted with a personal floatation device every time you embark upon the water with him. Don’t forget the sunscreen for your dog’s nose and belly, which are very susceptible to burning. The Ocean Kayak Malibu Two Tandem is an Amazon Bestseller, and people who kayak with their dogs love this 12 ft. sit-on-top gem. This recreational kayak is great for both roudy rapids and sedate, flat lakes. The Malibu Two can hold two adults plus a small child or medium-sized pooch, and can accommodate up to 425 pounds. Arrange the seats for one, two or three paddlers. The design of the hull makes this boat easily stackable for storage if you own more than one of these. 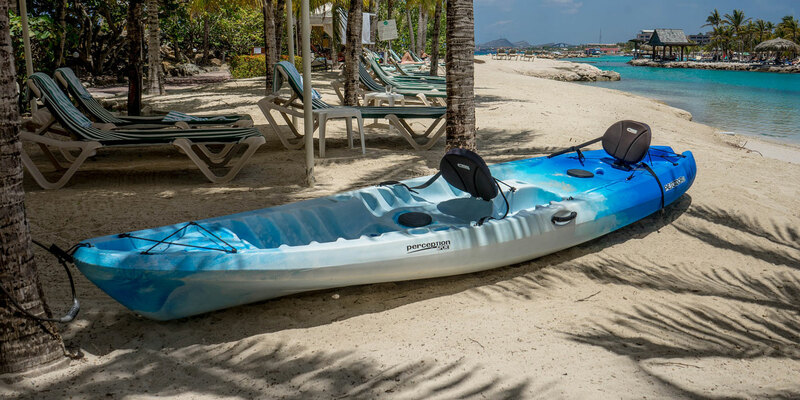 The Malibu Two kayak features three seating positions, three molded-in seat wells and handles, and gear straps. It is a very stable and easily maneuverable kayak option that is durable and also features a versatile deck which makes it a good kayak for dogs. The Perception Tribe is 13 and 1/2 feet in length and provides plenty of room for three adults, or two adults and one large dog. The boat has a wide hull and is low to the water, ensuring stability whether you are paddling in ocean surf or cruising on a lazy lake. Fido can sit proudly in front or behind as you navigate your way though the deep blue. This sit-on-top model can accommodate a total of 500 pounds, and is possibly the best kayak for dogs because of its comfort and safety while on the water. This kayak is also considered beginner friendly with a wide and stable hull and a rockered bow that helps with maneuverability. The seats are also foldable and padded and it also includes auto-draining scupper holes to help keep unwanted water out of the kayak and away from you and your dog. Believe it or not, many people take their dogs with them on trips in their inflatable kayaks! Most inflatables are constructed of very durable material, so as long as your dog’s nails are trimmed, your boat should weather the adventure just fine. A favorite inflatable of dog owners is the sit-inside Aquaglide Chinook XP Tandem. 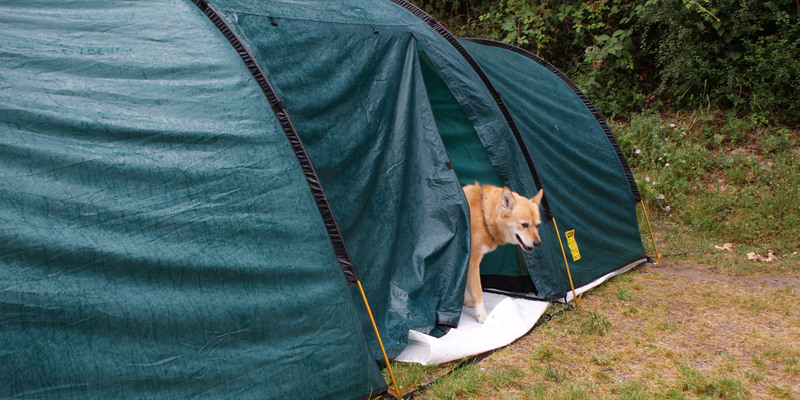 The Chinook XP can safely handle three people, or a larger dog and two paddlers. With an extra large cockpit, you can load and unload your dog with ease. This boat is 12 ft. 10 in. in length when inflated, and accommodates a total of 550 lbs, so even if your canine friend is a St. Bernard or a Great Dane, this boat can handle the load with him, you and even an additional person. Though this is an inflatable boat, the Chinook XP is constructed with X-beam technology, and a durable, puncture-resistant PVC beam floor. The rigid floor provides stability and excellent tracking. The Chinook XP kit ships with a repair kit, 2 core seats, a saddle seat, two footrests and a carrying bag. The Old Town Vapor 10 is a favorite of Amazon customers. This well-made sit-inside hard shell is designed with a huge cockpit and plenty of leg room, so your small to medium-size dog can sit inside between your legs while you paddle. It is a single user kayak but the bigger cockpit still allows comfort and safety within the hard shell so that your dog can snuggle up by your feet. The Vapor 10 is 10 feet in length and is easy to carry to waterside, weighing in at 47 pounds. The Vapor 10 is available in three models: The standard recreational yak, the XT and the Angler. The XT is basically the same as the standard Vapor 10, but includes a rigid day well cover. The Angler is equipped with rod holders and an anchor trolley system. 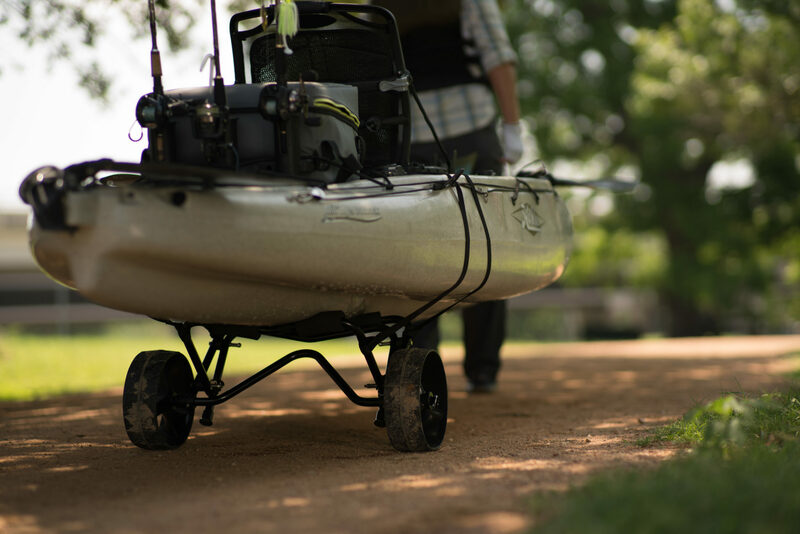 Whether you want to take your dog on a river cruise or fishing on the lake, the Vapor 10 is a great boat for the task. The Sea Eagle SE330 is one of the most popular inflatables and considered to be one of the best kayaks for dogs, especially if you are looking for an affordable and high-quality kayak. The Sea Eagle SE330 kit is equipped with everything you need to hit the water within minutes of receiving the boat. You get a repair kit, a quick fill high output air pump, two paddles, two inflatable seats with superb back support and a carrying case. This sit-inside inflatable is sturdy and durable enough to endure abuse from doggie paws due to the puncture-resistant material. However, it does lack the improved durability you may experience with a hard-plastic material. The Sea Eagle 330 can transport a total of 500 pounds, so this boat is great for one paddler and a large canine pal. This model weighs just 26 pounds when deflated, and will fit in the smallest car trunk. The hard shell, sit-on-top Lifetime Sport Fisher can be used as a solo or tandem craft, and is an excellent boat to take your large dog fishing with you. The low, sturdy hull is designed for standing or sitting sidesaddle so you can reel in that catch of the day with ease. Stash your paddles in the two molded paddle rests, and mount your poles in the four rod holders. The six-inch rear storage hatch provides a place to keep your gear dry. Two two-paddle oars are included with the 10 ft. Lifetime Sport Fisher kit. This kayak offers high stability, durability, and strength and has multiple footrest positions to accommodate different sizes of both dog and person riders. The Coleman Colorado is one of the most highly rated of all inflatable kayaks. This fishing craft’s adjustable seats can accommodate two adults, or one adult and a large dog. Eighteen-gauge PVC construction ensures that this yak is durable enough to withstand dog paws and rugged river bottoms. The fabric is durable and sturdy and this kayak treads water well. The Colorado is equipped with Berkley Quick Set fishing rod holders and fittings for a Sevylor trolling motor. This boat inflates to 10 feet, 9 inches, and is shipped with a pressure gauge and carrying case. The Colorado is an affordable option for those who want to paddle and fish while accompanied by their best buddy without the fear that their dog’s nails will tear at the kayak and puncture the material. The Riot Kayaks Edge LV is an excellent day touring boat that can accommodate both you and your dog, as long as your pooch can perch on the bow. This one-person hard side yak is great for mirror smooth lakes and flatwater excursions. The Edge LV is 14 and 1/2 feet long, and is equipped with covered dry wells on both the stern and bow. This yak is equipped with a pilot rudder system, so it tracks like a dream and turns on a dime. Though this slim-line and narrow boat is designed for one person, a small dog can fit in the ample cockpit along with the paddler. It is a good choice for both lakes and larger rivers. The Sun Dolphin Bali SS is a hybrid sit-in, sit-on-top kayak with a sunken cockpit, perfect for a day on the water for you and your dog. The open cockpit makes it easy for your pooch to come aboard. This kayak is suitable for a beginner or newbie and is lightweight but still offers immense stability. There is also a portable accessory carrier that can provide you with a bit of extra storage. The cockpit is also a comfortable spot that is spacious enough for you and your dog and comes equipped with protective thigh pads. The Bali is 10 ft. long, weighs 44 pounds and can handle loads up to 250 pounds. This craft is available in blue and red. If you are in the market for a high-end performance kayak you can enjoy with your canine companion, the Old Town Predator MX is a great choice. Not just a recreational craft, the 12 ft. Predator MX is equipped with rod holders and molded paddle rests for the avid angler. This boat is a bit heavier than most, weighing in at almost 60 pounds and can accommodate up to 400 pounds. This kayak offers comfortable seating for you and your dog with plenty of space and also offers great stability while in the water. As you can see, there are many suitable choices available if you are in the market for a kayak to share with your dog. From spacious cockpits to reinforced material to offer protection against your dog’s claws, you are sure to find something you will both be happy with and enjoy many times over. Now you know the best kayaks for dogs you are going to want to check out our review of the 10 best life jacket for dogs here!